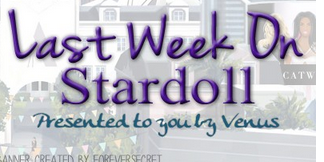 What a great week, at least on Stardoll. We got not one, but 2 limited collections this week, but also some other great 'ordinary' stuff. In case you missed something - well, better luck next time. But if you still want to catch up with this week's releases, read on. It all started with a new release in MR. - a boy clothing store. Stardoll keeps releasing guy clothes and more often than before. The reasons ma be to influence more male users to join the site, but also guys that have a female doll because of less clothing options, well I guess this helps. There are many nice items, like those coat, rucksack, or guitar case. I see even female dolls buying guy stuff, as some of the items work well for both genders. On Tuesday, we got a new Young Hollywood collection. Well an evening ago if I am correct, there was yet another annual Met Gala, so Stardoll, as usual, decided to treat with few outfits. Limited of course. 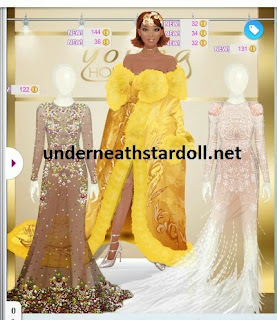 Now I am somewhat okay with chosen outfits, but honestly, there were too many wonderful dresses so I am wondering why Stardoll didn't try recreating some of those. Or wait until Friday and give us a 'regular' collection with more dresses. Honestly, I wasn't such a fan of outfits, but I loved Rhianna wig and shoes. I am not sure about you, but I'd rather not wear (and pay for) items that are barely visible. I actually wanted to buy Kim dress, but I was only missing few stardollars and was not superstar at the time. But this decision actually turned to be a really good one. You'll see. As this year's Met Gala was inspired by Chinese culture and fashion, so no wonder why Callie decided to release stuff with the same theme. We have lots of red and black combos, also blue and back. There are some really gorgeous items, for people who love that type of fashion. but in my opinion, the collection is just not my style. There aren't many rares that got re-released, which gave me a sigh of a relief. Ok, moving on to the final event for a week, and the best one in my opinion - we got a new Strike-a-Pose collection!! First of all, the collection is the best SAP collection ever released. Seriously, the best. But it may be only my opinion, as I adore formal gowns. It has some casual outfits, with shorts, short skirts, trench coats, but formal outfits are definitely the highlight of the collection, looking like straight from runway. Now when I saw the spoilers, and as I was not a superstar member, I had to renew my membership. I refused to pay for virtual items, but I knew I had to get them. I was low on stardollars though, still I managed to sell few items and get my favorites from the collection, including this fab interior. Now I know not many of you love formal stuff, but I do. Maybe because I rarely wear stuff like that in real life. Now I know many of you stayed up late or even whole nigh, missed school/college/work, missed eating, or watching your favorite TV show. Do not do it. It is not worth it. For example, when I saw spoilers on Thursday, I was pretty confident they'll be released the following day. And yes, I did watch latest TVD episode, but I took small breaks each 10-15 minutes to check if anything came out. Bottom line - you do not have to check every minute or 2. Relax, items will not sell out that fast. It takes about 10 to 20 items for the most popular items to sell out, but for most of them even more. And just relax. I did not get everything I wanted, but I did not make a big deal of it, asking people to gift me dresses. So that sums up the week. I hope you enjoyed it, and got your hands on stuff you wanted. I hope next will be even better, but honestly, it will be hard to top this. So as usual, vote, comment, and see you next week.